Scientists think there's a "dark matter hurricane" heading toward Earth. In fact, it might even be blowing through us already. But don't worry — it's definitely not going to kill you. Mostly, it's just a bunch of normal dark matter with especially good branding. And it really is headed (more or less) this way. Again, that hurricane is not going to kill you. Or blow the door off your house. But it just may cause some local spikes in dark matter, which would help researchers hunting dark matter actually find the stuff, the researchers wrote. 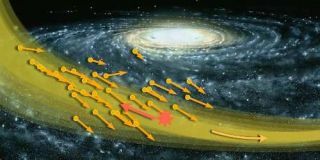 That's because all galaxies, but especially dwarf galaxies, are held together by dark matter, physicists believe. So, the galaxy that was torn to shreds birthing the S1 stream likely dumped a bunch of dark matter into the stream's path. So, the physicists behind the recent paper calculated how dense S1's dark matter would have to be to influence signals at several soon-to-be-built dark matter detectors. When those detectors come online, scientists will know a lot more about the "hurricane" and whether it's really blowing through our stellar neighborhood. Until then, it's fun to think about, isn't it? A dense cloud of dark matter from a dead galaxy blasting invisibly through us as it follows the remaining stars on their doomed parade.